Newcastle Upon Tyne – Taopix, the world’s leading photo commerce and personalisation software provider welcome Central Book Supply of the Philippines to the ever-increasing Taopix family as they prepare to go live with a new online and mobile service. Central Book Supply has been a customer of Taopix since 2011, using Taopix Desktop. Using Taopix Desktop allows consumers to download the photobook creation software on to their own computer and build their products and projects offline. Central Book Supply has chosen to augment its existing business by adding Taopix online to serve its customers preferring a browser experience or a phone or tablet based service. Central Book Supply has been in business over 60 years and currently employs 100 people. Central Book Supply serve both the retail consumer market and the professional photographer, both in store and online. As a book publisher, a specialist book-on-demand printer, and a photobook seller, Central Book Supply operate directly but also through 3rd parties. “We really love the fact that Taopix can provide our customers with a uniform experience across desktop, online and mobile. Our customers can work on their projects whenever, wherever and however they choose. Taopix integrates very easily in to our website and storefront.” explains Juan Carlos Sibal, VP of Operations at Central Book Supply. “Taopix is a complete package for photo books and the appearance of the user experience is really great, not to mention very easy to use. We also really value that Taopix continually invest in innovation with regular releases every year.” continues Sibal. “Central Book Supply is a well established and very experienced customer of Taopix and has been in the photo book business for many years. It is especially reassuring that such a company chooses again our software for an important area of growth.” says Les Bovenlander, Business Development Manager for Taopix Asia. “It is continually important to have a strong mix of desktop, online and mobile experiences in order to maximise growth opportunities for our customers. Being the only photo commerce software provider to offer this is clearly a strength for us.” adds Steffen Haaga, Commercial Director at Taopix. To learn more about our amazing software get in touch: https://taopix.com/get-in-touch. Or come and see us at Photokina 2018 in Cologne - Hall 5.1, Aisle: A, Stand No. 020. Or click below to book a meeting with us during the show: https://bit.ly/2LRGTbA. 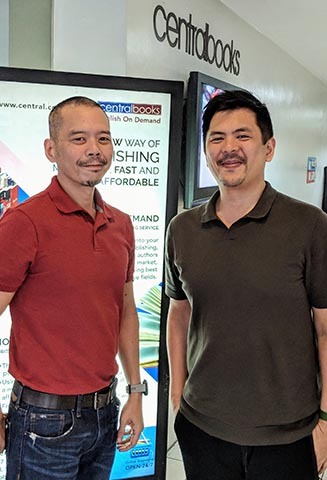 Robby and Carlos Sibal of Central Book Supply.